From Desert Island Discs to The Archers, I’m an avid radio listener. Given the choice between the radio and TV, I’d choose radio any day. Depending who’s on I constantly criss-cross between BBC Radio 4 and BBC Radio 5 live. I love Tony Livesey on 5 live Drive. The one-time editor of the Daily Sport is genuinely funny but never gets in the way of a breaking news story. I’m not a fan of afternoon presenter Nihal Arthanayake because he constantly interrupts his interviewees and talks about himself far too much. Sorry Nihal. But my absolute pin-up is Stephen Nolan, who presents the late-night show on BBC Radio 5 live at weekends. To regular listeners like me, Nolan feels like a friend, a comforting voice in troubled times who gets the balance between public and private exactly right. He doesn’t talk much about himself but occasionally mentions his weight woes, which make us listeners like him even more. My car is like an extra cupboard, crammed with ancient CDs, clothes I mean to take to the charity shop and a host of bright yellow hangers I need to return to the dry cleaners. When I braked sharply the other day a CD clattered on to the floor. Picking it up, I smiled to myself. It was a CD I hadn’t played in years – a Christmas radio show made for me by my children when they were 11 and 14. I stuffed it in the CD player and the years instantly fell away. The recording included my son and daughter expressing horror at my favourite records of the time (Lily Allen and Teddy Thompson), giving an impromptu performance of Sgt Pepper’s Lonely Hearts Club Band that ended in raucous laughter and sweetly playing Ralph Vaughan Williams’s A Lark Ascending in memory of my mum. A year after they recorded the show I begged them to do another but they refused point blank, saying it was far too embarrassing. They’d be absolutely horrified if they knew I’d been playing it non-stop all week. Amidst the sleet and the snow there’s been one bright spark. 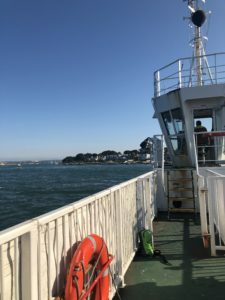 Yes, the Sandbanks ferry is back in action after 12 long weeks. It’s running a restricted service but I don’t care. My husband’s getting an extra 30 minutes of sleep, the local shopkeepers are relieved there’ll be more visitors at the weekend (snow permitting) and I can get to the bright lights of Bournemouth in 30 minutes instead of an hour. PS. We all had a laugh at Mail Online’s coverage of the story. “Millionaires of exclusive Sandbanks peninsula are stranded as local ferry is out of action for 12 weeks,” ran the headline. Er no. I think the reporter needs a geography lesson. Sandbanks is less than five miles from Bournemouth town centre and the millionaires who live there, Harry Redknapp among them, certainly aren’t stranded.